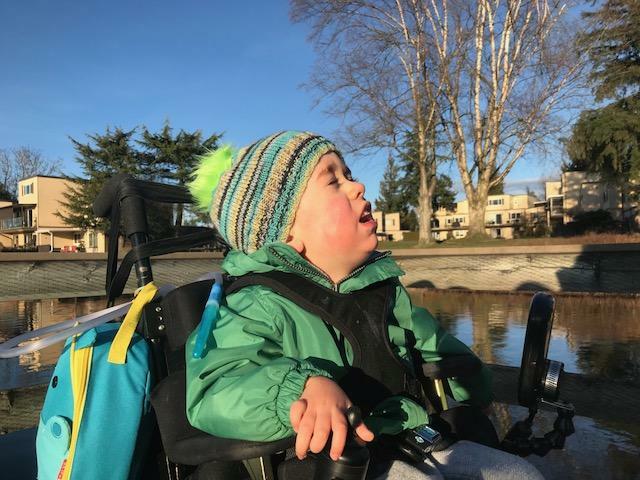 Emmett loves life and he thrives on new experiences. 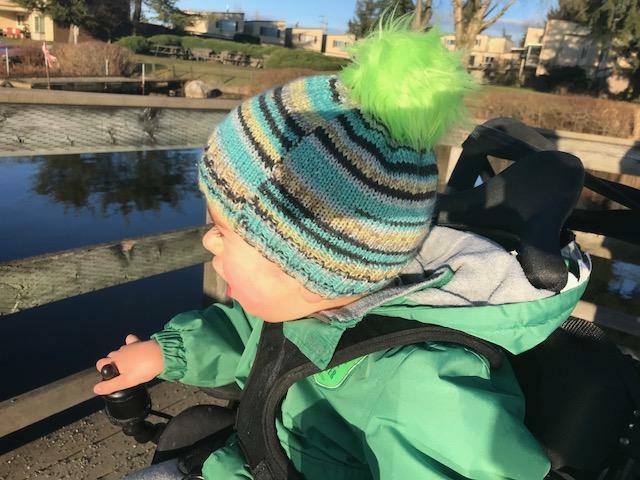 Of course, as you realize a simple cold can mean an ICU stay for Emmett so he does not always get to do things that most kids can do. Emmett loves buses. He sees them. He hears them. And he loves them. However, riding on a public bus would be so risky due to the challenge of picking up a cold so that simply has never happened. 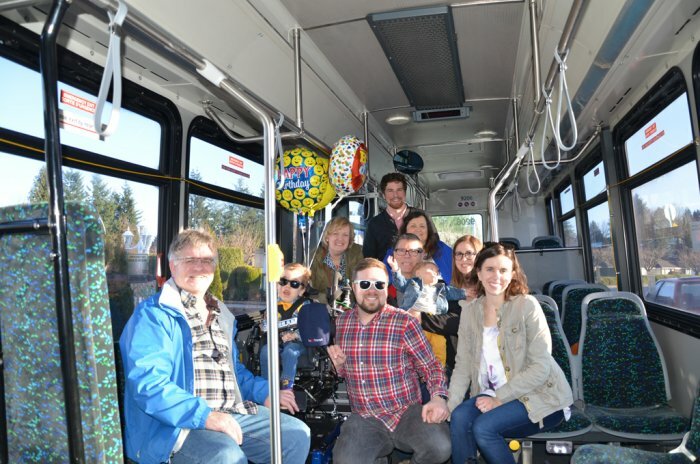 So for part of his birthday celebration we asked BC Transit if they could help us out - thinking that one of the small handicapped busses would make Emmett's day. Well, BC Transit and First Transit Canada had a better ideal. A BIG BUS! It was fantastic. 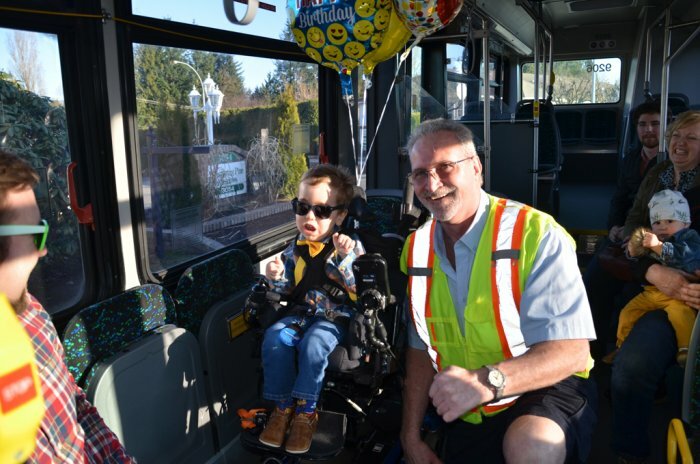 The team at First Transit Canada - BJ, James, and Calvin (to name a few) - were so enthusiastic about giving this little boy a special day. 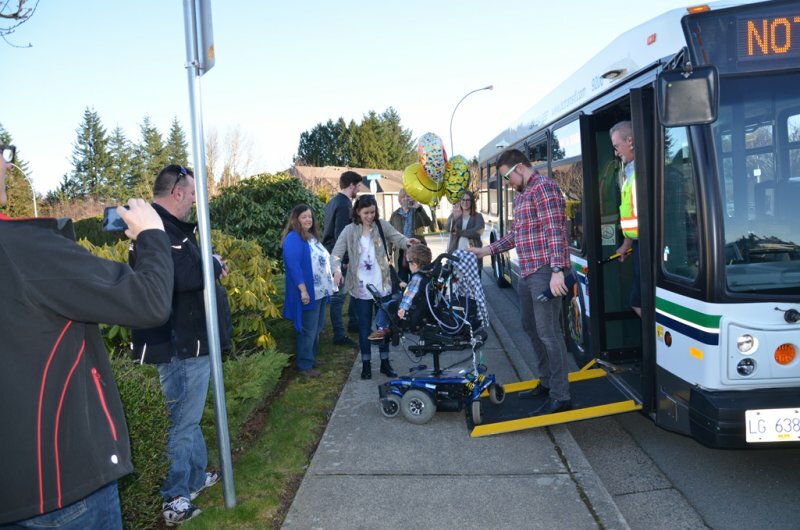 The big bus showed up and Emmett's face was one of surprise as it rounded the corner and then pulled up to a stop in front of him. Then he rode around the block! Literally, around the block. Emmett had so much fun. And he had a bunch of his people, including his cousin Henry, along on the ride with him. 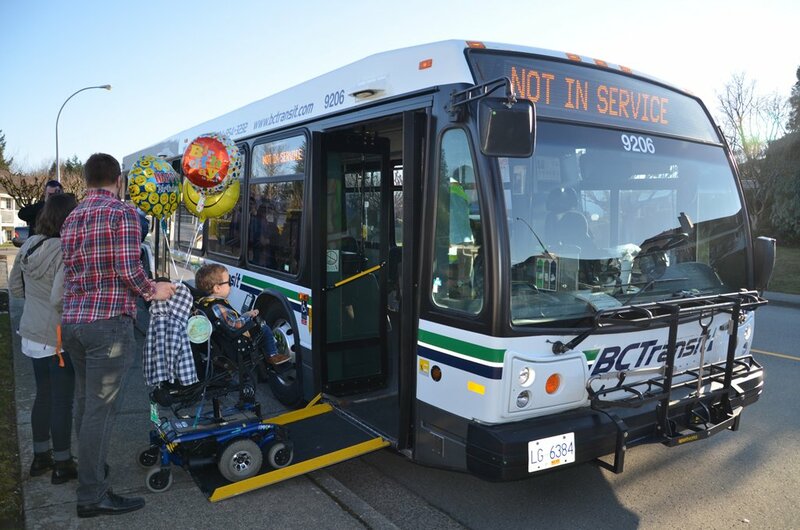 BC Transit and First Transit Canada - Thank you! 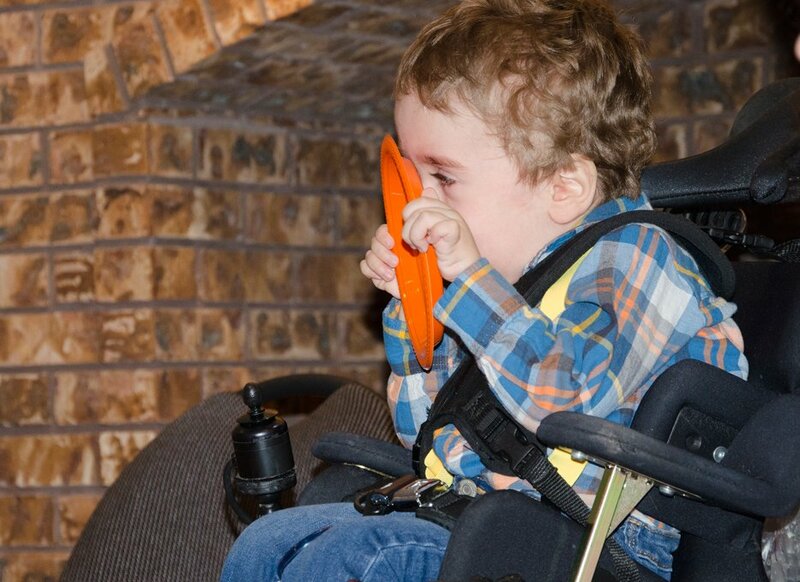 You have given this little boy a memory that he won't soon forget. 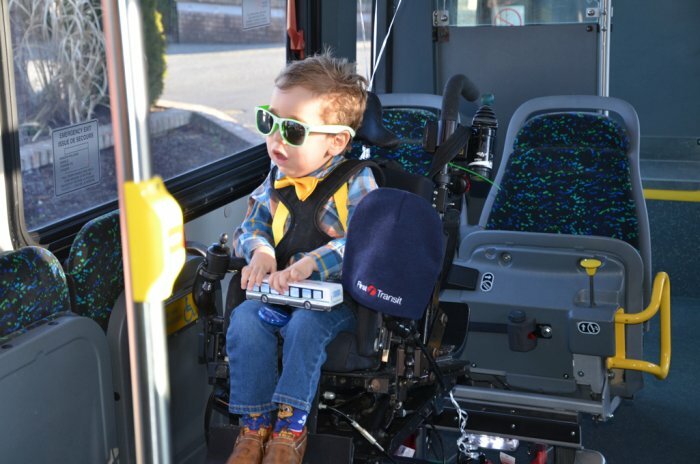 Emmett got to take his power chair right onto the bus. 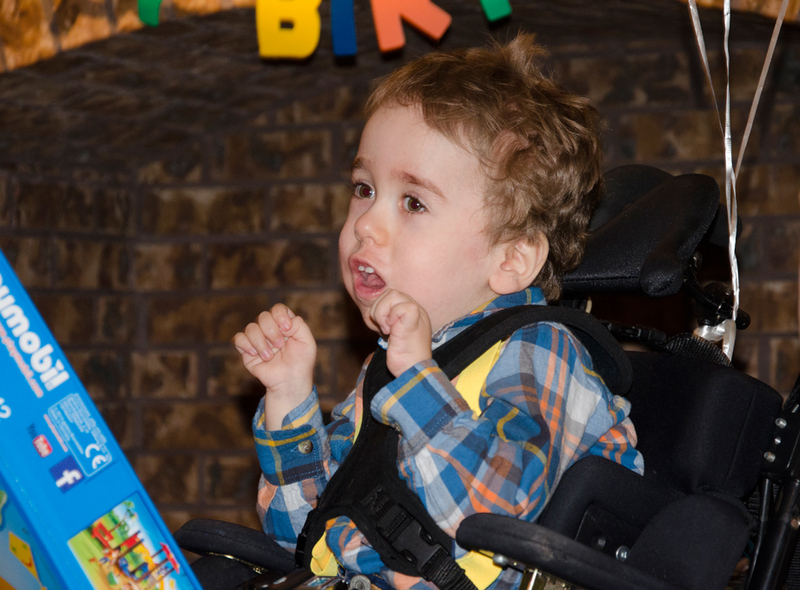 Driver Calvin ensured that Emmett and his chair were securely fastened in place. Not only does the bus lower down for entry, but it has a power ramp for incredibly easy access. Then a fully flat floor that was so easy for Emmett's chair. 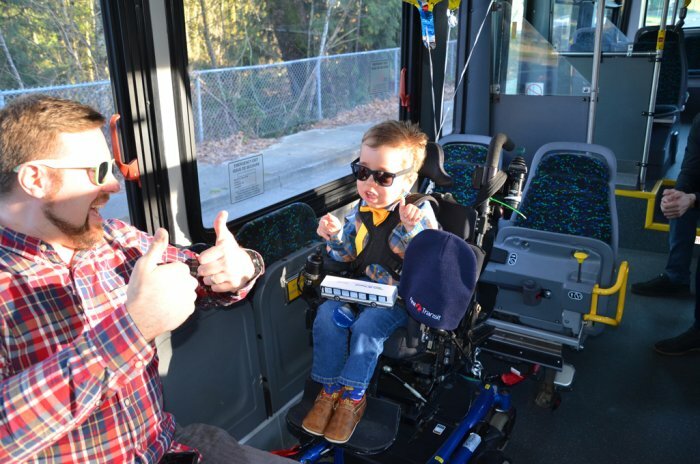 First Transit Supervisor James presented Emmett with a hat, sunglasses, and his very own bus. Even better, this bus is cardboard meaning that Emmett can easily pick it up. He drove it back and forth on his lap while waiting for the bus trip to start. 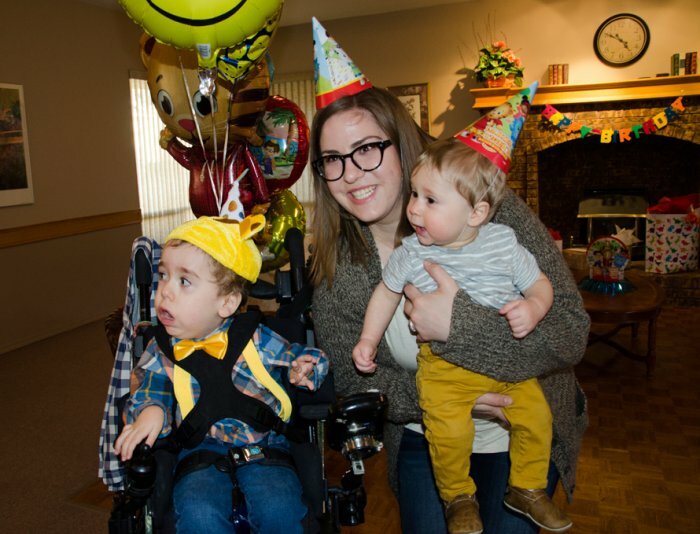 Along with Emmett for the ride were his mom and dad, both sets of grandparents, his Aunt Jennie and her son Henry, and his Uncle Ben. 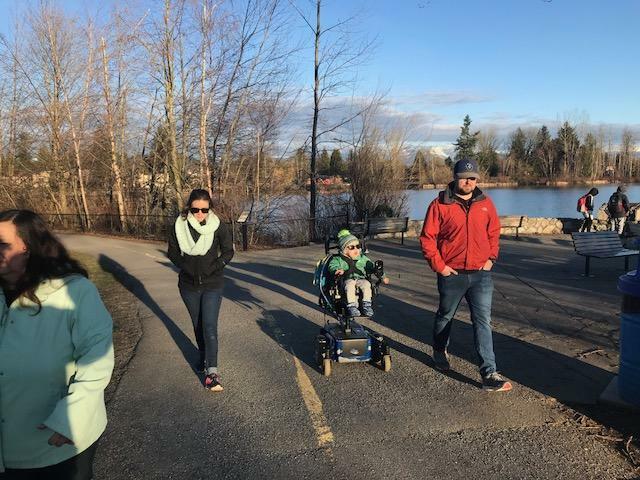 Missing from the trip were Aunt Katie and Uncle Josh (Australia) and Uncle Ben (Jennie's husband) in Alberta. The ride around the block was superb. 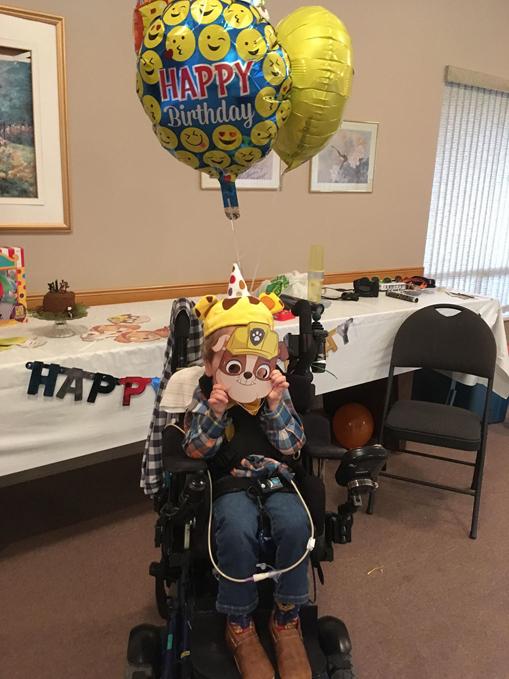 Emmett loved it and, back at the party room, regaled us with stories of his adventures that were combined with exaggerated head movements to show his audience just how exciting his ride was. He literally tossed his head to both sides and forwards/backwards with great enthusiasm in his retell. We want you to know, however, that Emmett's head control was really good and he handled the turns, stops, and acceleration very well. 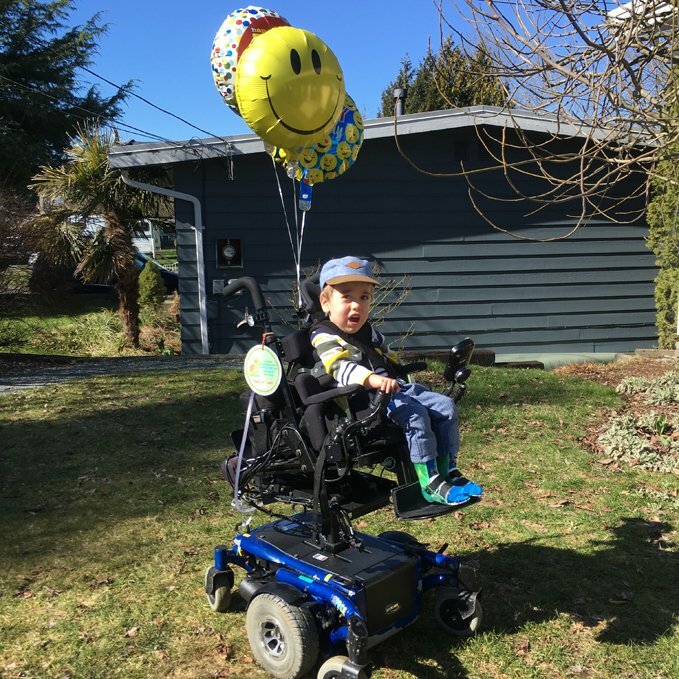 This was Emmett's first time being transported in his chair and facing forward. In his van, Emmett still uses either his car bed or his car seat. He doesn't ride in his chair - yet. While a bus is exciting enough, Emmett went back for even more party fun. A Daniel Tiger hat, freeze dance, peek-a-boo, and pin-the-tail-on-the-donkey were just some of the incredibly exciting activities. Paw Patrol Masks and Disney character masks were a lot of fun ... but so was an orange pie plate! Emmett and Henry were too distracted to look at the camera. This birthday was made more special celebrating with family. It was awesome for Emmett to have his Aunt Jennie visiting from Calgary and then to chat on the phone with his Aunt Katie and Uncle Josh! Three year old Emmett has a busy week ahead of him. 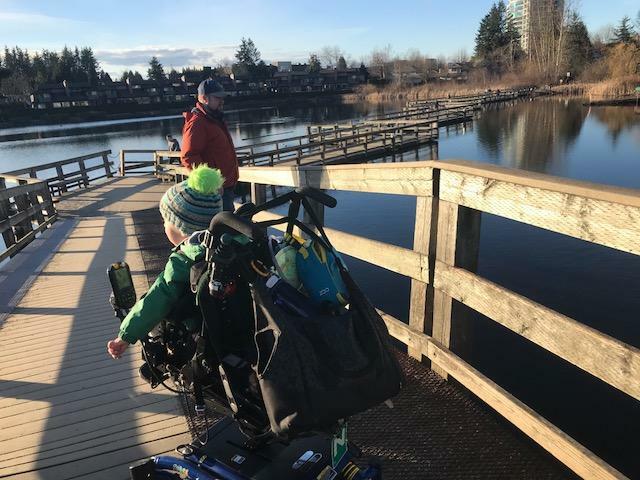 Right now he is staying at Canuck Place in Vancouver - with his mom and dad - as he has a number of appointments in Vancouver at BCCH, getting his chair adjusted, and then on Wednesday it is time for another lumbar puncture and injection of Spinraza. All good things but certainly not the most fun. Emmett's questions about this hospital trip? Were they going to put tubes up his nose? What about his mouth, were they going to put a tube down his mouth? Alisha and Josh have reassured him that that won't happen this time. He doesn't have a cold or RSV or anything like that. Phew! 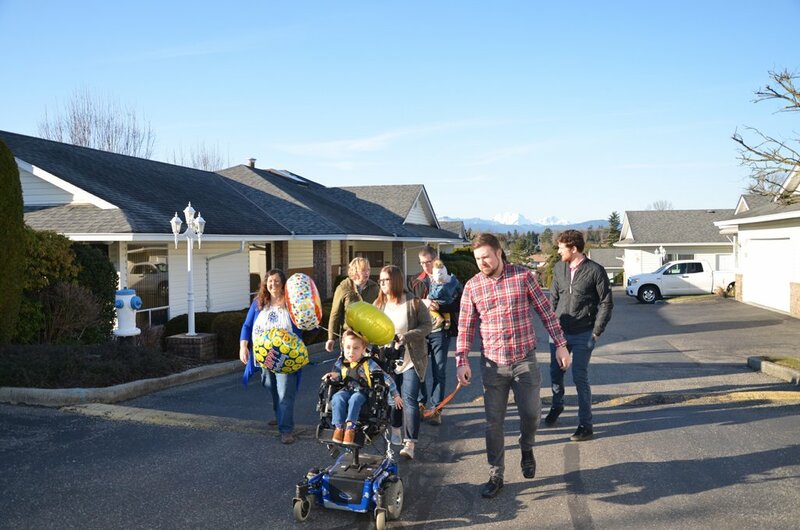 Wednesday is the big day and Emmett, all of us are here for you and supporting you. You've got this! The video was wonderful. We could really see how excited he was. Praying his fourth year will be the best!! You all know how to party! How very special that a HUGE bus would arrive and take you all for a ride. Emmett will remember that adventure forever, as will all of the rest of you. 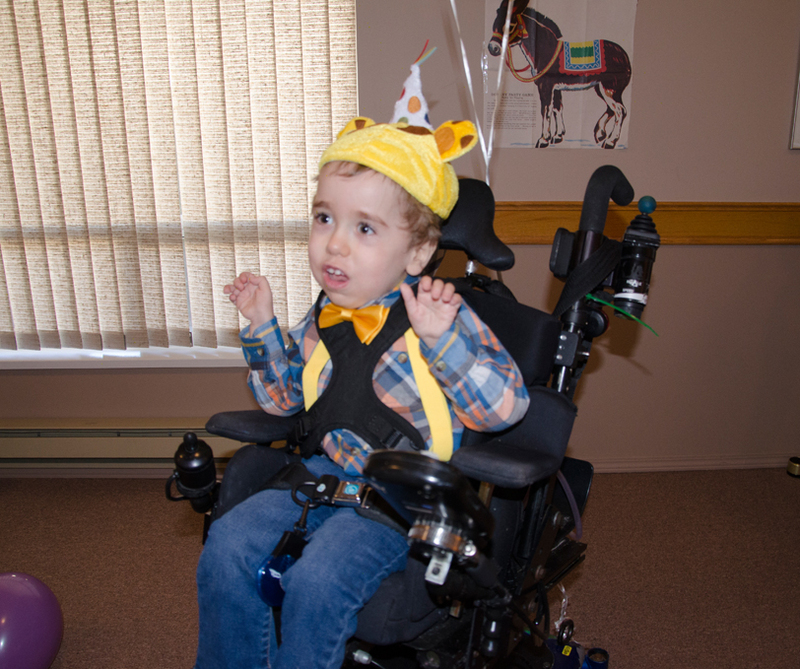 We rejoice with you as you celebrate Emmett's 3rd birthday. Wow! Simply wow! Yesterday if you asked Emmett how old he was he was say two. When you asked him how old he would be tomorrow (which is now today) and he would respond three! Every now and then he will sing Happy Birthday to himself. And when you ask him what he wants for his birthday he will go "Ho! Ho! Ho!" because he wants Santa for his birthday. Well, unfortunately he is not going to get Santa but he is going to get something big and surprising. 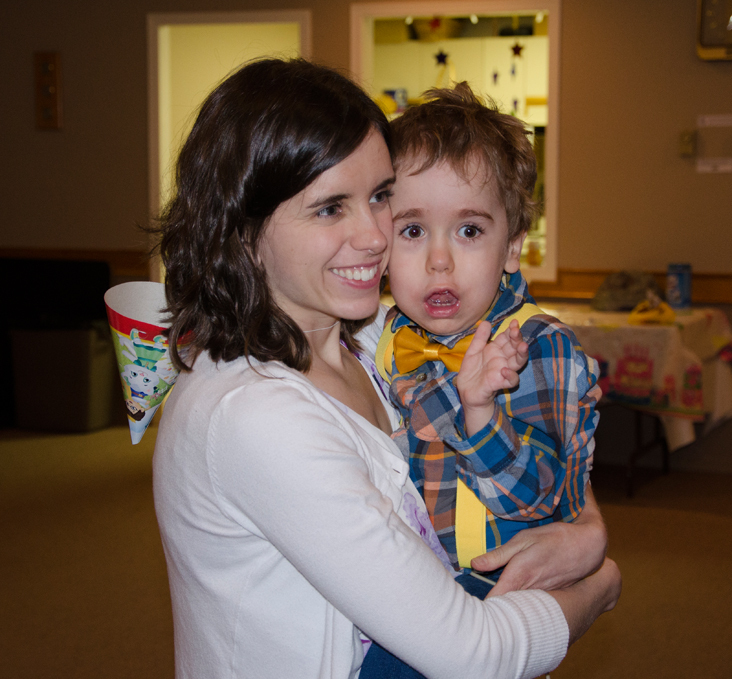 We will have a blog post in a few more days after his Saturday birthday party. Today is low key. He's going to heat to the Vancouver Zoo to enjoy the animals. If he's lucky, maybe the hippopotamus will be active today! The bear close to the fence. The giraffe peering over the fence at him. 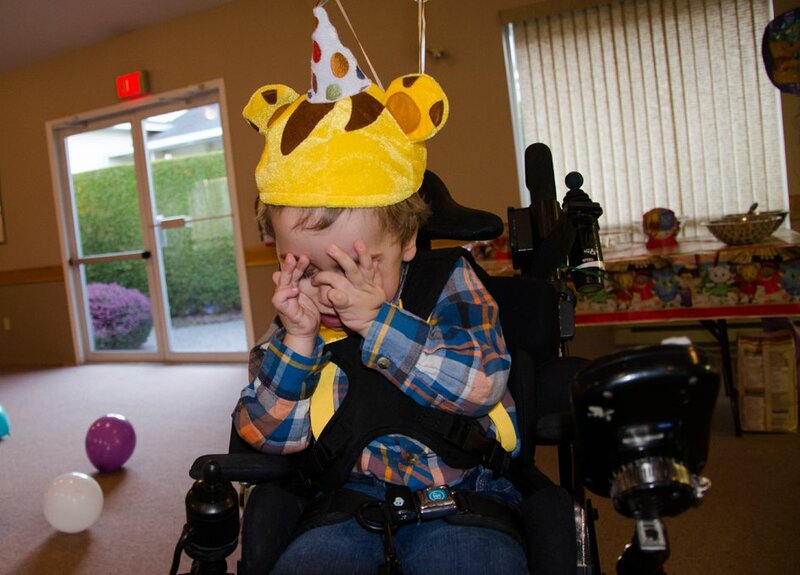 This is also a day to remember everything that has happened since his diagnosis two and a half years ago. 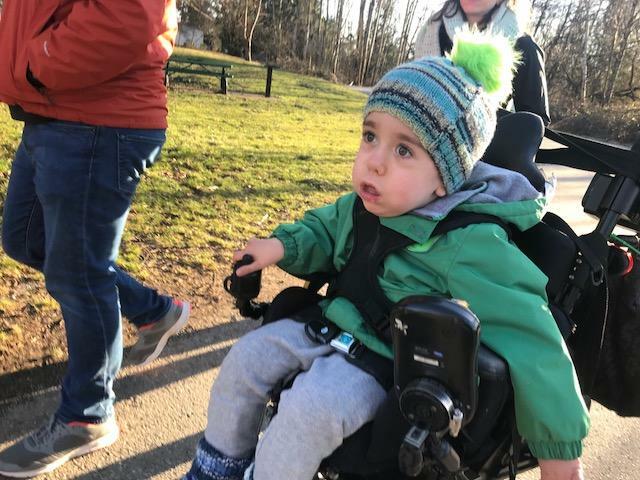 How he had lost so much ability to move as Spinal Muscular Atrophy had such a grip on his body. And yet now he is stronger than ever. Sitting up in his Mega Seat for hours at a time playing catch and playing with his mom's doll house. Travelling in a car seat after years of only being able to travel in a car bed. Hearing his excitement as he observes trucks, construction equipment, and buses through his van window. So many positive things have happened. Emmett has blessed our family. He is such a joyful little boy. Ask him to pose for a photo and he'll give you a cheesy smile! Eyes closed too!